Glass Ants are a fascinating species. We discovered them on an arid desert world last visited by humanity aeons ago. They seem to have evolved from an Earth species into something unique. Glass Ants seem to have two interesting methods when it comes to preserving water. First, the insides of their nests are made of fused silicates, forming a water-tight seal that prevents moisture from leaching into the arid environment around them. The humidity inside such a nest allows for the comfortable gestation of infant ants even when the air outside is totally dry. Second, sometimes a caste of the ants that we haven't observed in any other species (we call them "doorway ants") wedge themselves at the mouths of tunnels to better seal the moisture into the nest. In extreme temperatures we've seen these ants sacrificing themselves in order to keep those within safe. The Glass Ant nests can extend for many meters horizontally; we recorded one with tunnels nearly a meter deep. Sometimes the wind blows the sand away from the top of the nest (a situation that would leave other insects in peril) but the Glass Ant nests protrude stably above the surface, a bizarre testament to the skill of their constructors. In these situations, Glass Ants have been observed entering and exiting through mid-level entrances, while doorway ants block up the exposed but useless entrances high in the air. If anyone back at HQ has any ideas, we'd love to hear them so we can try confirm their behaviour. Joe, this is the HQ. It's likely the ants do not really melt the glass. In the 20th century some material scientists on Earth developed a kind of photoresist (called spin-on glass) which, after exposure to UV or e-beam and curing, would become what is for all intents and purposes, glass: randomly arranged SiO$_2$ chains. The principle is fairly similar to that of epoxy resins, providing that Si atoms are present in the precursor molecules. We believe these smart ants must have developed the ability to secrete such precursors and trigger the curing via some enzyme. Like the Earth wasps that chew wood fibers to produce paper for their nest, these ants chew these precursors and use them to cover the walls of their tunnel, initiating then the curing. As bonus for them, H$_2$O molecules are released during curing, which is a definite plus given the dry environment where they live. Your ants deposit a line of thermite in a new tunnel, then ignite it (bonus points if they use a glass lens and sunlight for it) after scrambling the hell out of reach. There are already organisms that secrete glass without high temperatures. Diatoms and radiolarians secrete a glass protective skeleton. You just need the right enzymes or organic acids to dissolve the silica in the sand. Many ants use symbiotic bacteria or fungi so the ants could be spreading a different organism the secretes a glass skeleton. Or the ants could just handle it themselves; it would not be shiny clear glass, but you would not get that from melting the sand either due to all the impurities – see fulgurites or lightning glass. Secreted glass on the other hand can be shiny and clear if it is secreted slowly. Joe: Some folks back at HQ have some doubts about the Glass Ants building these tunnels. Instead, they may be excavating them. Desert glass is naturally occurring glass made when lightning strikes desert stands. The lightning fuses the silica together to form glass. Your Glass Ants may be finding natural deposits of this glass and then burrowing into it. This theory seems plausible especially since you note wide nests instead of deep nests. Now, the natural desert glass doesn't form long chains of glass. You get a lot of individual nuggets along the lightning's path. So, if this theory is correct, you should be able to check the tunnels for seams where the ants have joined two nuggets together and then drilled into them. On the other hand, the ants might be fusing the glass themselves by laying down naturally occurring aluminum deposits and waiting for a lightning strike. This would create long chains of the glass all by itself which the ants could then drill into, without seams. Consider that during the desert monsoon season, the ants have water, so they might just need a more conventional nest, and the wet sand provides enough structure for temporary nests. Away from that temporary structure, they lay out the aluminum paths. The lightning in this desert during a monsoon may be common enough that the ants can count on this as a construction technique. Once the lightning strikes, they drill in to create the permanent nest that will see them through the dry times. Note also that hollow plant structures are common, such as bamboo. https://en.wikipedia.org/wiki/Silicic_acid From silicic acid, it's a short step to 'water glass': https://en.wikipedia.org/wiki/Sodium_silicate from which glass can be made. Ants enter the root system, eat the nodes (places that block the hollow places) and concentrate/store the 'water-glass' in specialized 'water-glass-pot' ants, until needed for waterproofing/sealing/repairs. The ants cannot produce the temperatures required from their own bodies but could construct something using materials which burn at a high temperature. But that's problematic.There is no known biological system which can produce pure aluminum. Aluminum is pretty much absent from earth biology despite being the third most common element on earth. So making aluminum powder is biologically problematic. We also have a problem with ignition. You need burning magnesium or similar to light thermite. 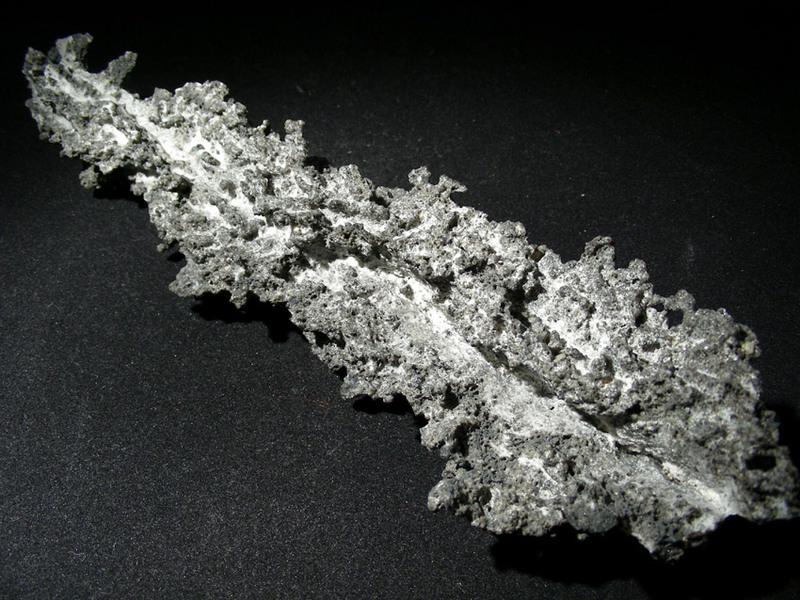 Creating pure aluminum is unfortunately apparently almost impossible but there is an alternative that might be vaguely biologically plausible. This also solves the problem of ignition. These 2 react at any temperature near or above room temperature. Glycerin is readily produced by a number of plants already. A symbiotic fungus could act as the colonies source of Glycerin which could also act as a food store much like honey. This helps us come up with a sort of coherent path for evolution as well. 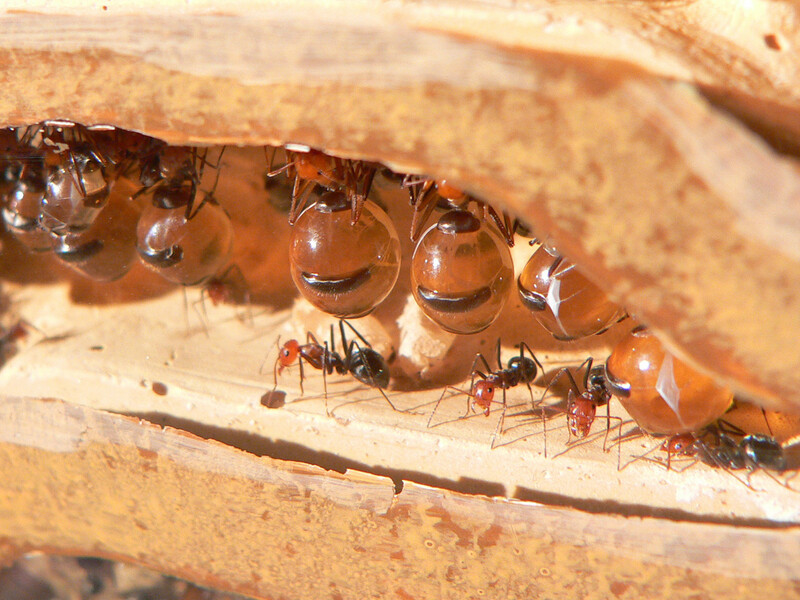 First the ants evolve a food storage class, much like Honeypot Ants. Next they evolve a system for suppressing the growth of some kind of bacteria or mold in their cavern walls. A caste of ants produces or consumes and regurgitates (perhaps again with the help of some fungus) a weak dilute solution of Potassium permanganate into the sand in the walls of their tunnels to keep them sterile. Now there's only one final step: Combining them. Eventually the ants evolve a behaviour where they coat the inside of a new chamber in thick permanganate. During the coldest nights larder ants enter or are carried and spew a thick layer of Glycerin on the walls and then retreat. The reaction does not start while the temperature is very low. Come the morning light starts to warm the sand. Around the new chamber it passes the critical point and the reaction kicks off. The walls start to glow and fumes billow out of any unblocked exits. A few moments later the reaction finishes and the walls start to cool into glass. Note that it would be a very dirty glass, not perfectly clear since some only partially fused sand would be stuck to it. Diatoms are algae that make silica shells. They do not use heat, of course; they deposit hydrated soluble silica (as silicic acid) along with organic matrix to produce their shells. The shells last a very very long time. Having an ant acquire silica manipulating abilities is quite an evolutionary jump. It must not be easy given that no other shell-forming creature makes their shells out of silica except for diatoms. But ant colonies are known to acquire other creatures and incorporate them into their societies - an example is the fungus used by leaf cutter ants, which has been associated with the ants so long that there are no wild versions known to exist. 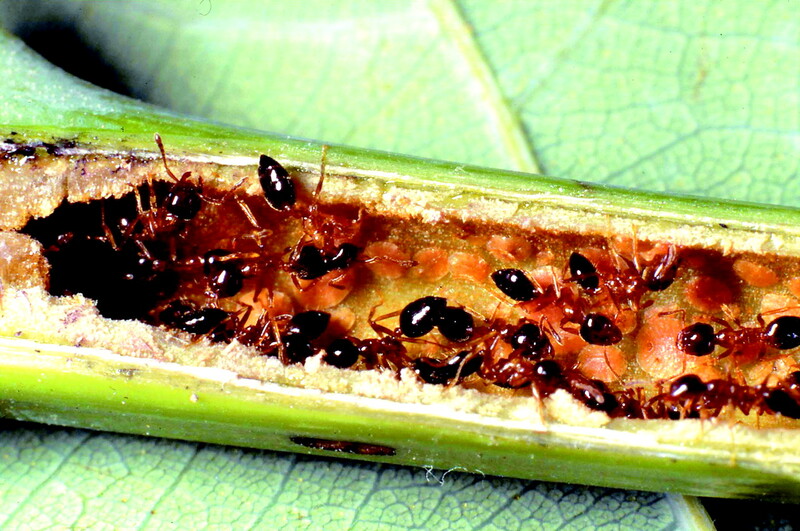 Another example are aphids which the ants tend and protect in exchange for their sweet secretions. Your glass ants could have tame diatoms which they cultivate in a diatom colony. I imagine a diatom chamber where they are tended. Maybe it has a semitransparent roof to let in light which could explain the partly aboveground nests. The diatoms secrete a gooey amalgam of hydrated silica and organic schmutz which the ants use to glue grains of sand together in constructing their colony. This is similar to what termites do except the termites themselves secrete the goo, which is just organic glue and so not as durable as diatom goo might be. Since this is science fiction one could even make this diatom goo harden into opal, a gem comprised of precipitated soluble silica. That would make for pretty nests. As an afterthought I think the ants plugging chambers with their bodies is a nonstarter. Ant dies, dries, chamber is unplugged. Termites plug up their chambers too, for the same reason as these glass ants. Termites use dirt and rocks. Some hypothesize that the ants don't actually create the glass, or burrow in glass, but actually assemble it. This world's deserts might naturally contain a high glass content (explaining some interesting aspect to the terrain), and the ants hunt down shards of this material, and line their tunnels. To add the structural integrity, they fuse the pieces with secreted resins, resulting in their tunnels, when dug up, having the look of a sculpture made of stained glass window. This is much more efficient for the ants than lining their tunnels with pure resin, as it doesn't sap nearly as much of their precious moisture. Locals, when looking to settle new areas of the arid planet, are encouraged to dig up small portions of a hill of glass ants (please use proper protective equipment). The ratio of glass to resin is usually a good indicator of how much moisture the area receives. Reading some comments and answers on here gave me another idea about how they do it -- and explains why glass ant colonies taken into captivity never seem to recreate their unique glass tunnels even in ample-sized sandboxes (pardon the pun): Lightning rods. The coming rains will ensure the queen and her "borrowed" workers stay hydrated while they seek an adequate location for a nest. Rainfall is frequently accompanied by lightning storms... and this is how they start their new nest. Once the nest has been formed, rainfall collects in reservoirs at the bottom of the nest to provide a source of moisture as well as maintain ambient humidity in the nest. Once they have the tunnels in place, the workers begin climbing atop one another at the entrance, forming a tower; these towers are estimated to reach nearly three meters tall* and are easily the tallest objects in the nearby landscape. Having been freshly hydrated, their bodies are rather conductive, and thus "attract" lightning. The trick is that the resinous secretions are also conductive, so once the lightning strikes the "ant rod" it carries through the secretions along the tunnel walls and fuses the silica into glass, taking advantage of a natural phenomena to help strengthen and seal their home. Of course the ants that form the ant rod are killed in the process, but this provides a handy source of food for the remaining ants. It may not be the most nutritious, but it buys time for the colony to establish itself. The remaining ants will carry the burnt remains into the tunnels, and also scout them for any gaps that may not have fused. More resin secretions will be used to fill the gaps, and once cured is nearly as transparent and nonporous as the glass, while lending additional strength to the structure. Similar to the Cephalotes genera of ants pointed out by @LoneBoat, the colony has a caste of large-headed workers whose sole purpose is to block the entrance(s) to the tunnel. In addition to providing defense and sealing in moisture, the "blockers" also serve to regulate water intake during desert rains. 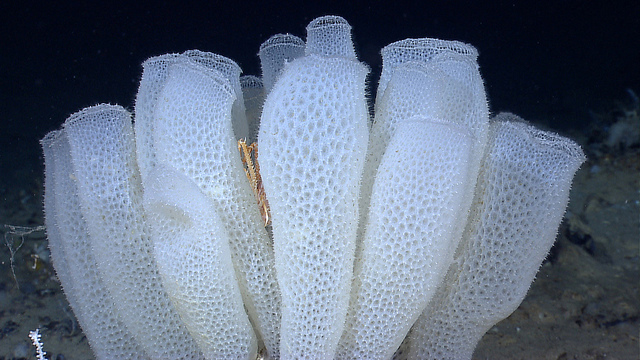 Most of the surface area of their head is a nonporous, chitinous material that serves as armor as well as a moisture barrier; most blockers have two to three small dimples in this barrier, and each dimple contains a tiny sensory receptor in its center about 100-200µm in diameter. This receptor lets them detect moisture, and they will unblock the hole when rains come so water can come in to replenish the reservoirs. As the water pours in, regular workers scurry down to the reservoirs to monitor them; once the reservoirs are nearly full, the workers make for the tunnel entrances and gently nip the blockers who will promptly return to their position and seal off the entrances so the tunnels don't flood. Once back in position, the blockers will refuse to move until their receptors tell them it's dry outside. While the colony will attempt to locate on high ground (improving probability of lightning strikes and minimizing flood risk) localized flooding can still pose a threat, so the workers will remain in place keeping the tunnels sealed. * Individual worker ants are about 15-20mm in length, and the expedition's initial estimates suggest that the towers are comprised of 500-800 ants and the height and diameter is roughly relational to how many total ants the new queen was able to recruit. Naturally, more recruits means a taller and stronger tower, which improves the tower's chances of successfully getting hit by lightning to form their new home and thus improves the colony's chances of survival. In addition to the excellent answers that provide a non-thermal method, you might consider a snap induced heat burst as used by snapping shrimp. As it collapses, the cavitation bubble reaches temperatures of over 5,000 K (4,700 °C). I would imagine that as insects and crustaceans have somewhat similar construction it wouldn't be totally out of the question for an ant to evolve to use its mandibles in a similar way, possibly fusing one grain at a time with a rapid succession of snaps like a little MIG welder. Not the answer you're looking for? Browse other questions tagged xenobiology materials insectoid or ask your own question. How could non-photosynthetic non-chemotrophic autotrophs create usable energy? Can You Mix Glass in a Metal Alloy? Why do shapeshifters not kill their doubles before taking their form?